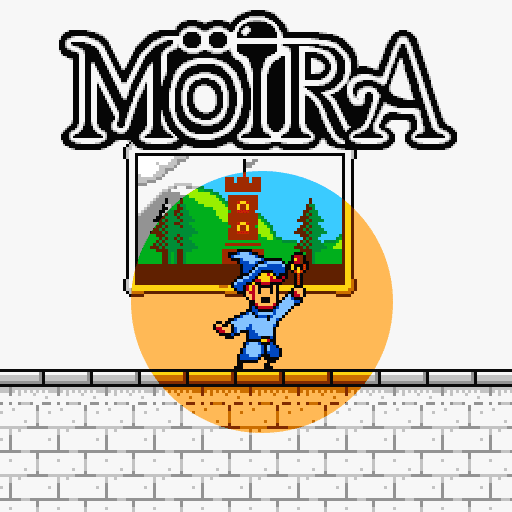 Onagro Studio recently launched a crowdfunding campaign for their 8-bit retro platformer Möira. The Brazilian company has been participating in game jams in the past but this is their first attempt at a full game. This project has been in development since 2014 and it shows, since a lot of elements look polished. Onagro Studio even has gotten the game approved through Steam’s Greenlight program. Möira takes place in the kingdom of Anemos, where the high wizard Zeppeli has gone missing. Even worse, the evil sage Anaxagoras is terrorizing the land with the power of the Chroma, a weapon that can change the color of anything, allowing the sage to reshape the world in his own image. Rubick, Zeppeli’s worst student and wannabe wizard, must find out what happened to his teacher and stop Anaxagoras from ruling the land. Luckily our hero will be accompanied by his two (smarter) friends Ashley and Nico for support. Will Rubick’s ability to mimic and mix magic be enough to save Anemos? Explaining the gameplay of Möira is basically name-dropping a ton of old school (and some new school) video games. There’s the candle whacking of Castlevania, the enemy bouncing of Shovel Knight, the copy ability of Kirby, the multiple item uses of Metroid, the overworld of Super Mario Bros 3 and the punishing difficulty of Mega Man. It seems that much like the aforementioned Shovel Knight, Onagro Studio is going to attempt to find the perfect balance of all these inspirations and create a fresh experience. It helps that Rubrick’s wand’s copy ability also has a fun spin where different mimicked powers can be combined to create a new skill. For instance, mixing the sword spell with the beam spell creates the Zelda inspired Magic Sword. More interesting is that combining elements in a specific order changes the new power that you receive; so mixing beam with sword creates a completely different power. Mimicking and mixing in action… Gogo would be so proud. The color aspect of the game also makes it stand out from usual retro-saturated indie games. Anaxagoras’ Chroma weapon is a nice way of tying the obvious Game Boy inspiration into the world of Möira. It’s not stated how the different pigmentations will effect, if at all, the gameplay but some of the palettes are pretty inventive. There’s the monochrome from the Game Boy, and the red and black from the Virtual Boy, and even the muted colors from the ZX Spectrum. Regardless of the hue of the world of Anemos, this game looks ‘colorful’ in both character and environments. The animations of the sprites have this whimsical quality to them that makes it difficult not to fall in love with Rubick and the monsters of the land. Palette swapping… Scorpion, Reptile and Ermac approve. Aside from the pleasant art design and the fun-with-colors approach, Möira has a few other tricks to impress you with. The soundtrack and SFX are charmingly simple and from the first blink sound from the pitch video, you know that the sound team has done an excellent job. There’s even a 30 minute demo for the game which you should definitely check out if you’re thinking of supporting this campaign. And finally, there seems to be secrets aplenty that will be in the main game, that are already in the demo, and that are even in the Kickstarter page itself! Onagro Studio is currently looking for €12,000 (about 13,500 USD) to fund their game. At the moment they are a quarter of the way there with about a month left to go. They are offering various funding levels such as an early bird digital copy at €5 and a physical edition at €30 and a collector’s edition at €70. They also have the great idea to allow a backer to create their own color palette at €100. There are some interesting stretch goals as well, such as the ability to play as the blue archer from TowerFall at €14,000, and the ability to play as the Neko Chroma Rider from Chroma Squad at €22,000, and a Wii U port at €36,000. Even though this looks like a good title to support (the team even has a pretty decent budgetary pie chart) it’s always good to look at these campaigns carefully and see if they’re for you. Play the demo, watch the pitch video, check out the Steam page, look at official website and then make your decision. If you still want to paint this town red (and a variety of other colors) you have until Apr 13, 10:38am EST.